Playing such a well-known character as Annie, Beck said she pulled from the Annie that everyone knows and added characteristics herself to develop her part. “It’s a lot of just going over the script and really thinking about what your lines mean and why you are saying everything and developing a relationship with everyone in the cast too to create that dynamic between characters,” Beck said. One of those cast members she needs to develop a relationship with is Eloise Fletcher who plays Molly, the orphan that Annie looks out for. This is Fletcher’s first high school play. Normally very quiet, she said had to learn to act out on stage. Playing Daddy Warbucks, Gabe Smith shaved his head to get into the part but it is the music that Smith said he enjoys most about his character. “I love singing. Singing is my favorite part of the stage performance. I really enjoy practicing my songs, the development of getting to the next level and then, obviously, the performances, trying to do my best to play that part I’m trying to personify,” Smith said. The musical runs Friday, Saturday, Sunday afternoon, Monday and Tuesday at the Escanaba High School auditorium. Tickets are available during practices at the school or at the door. 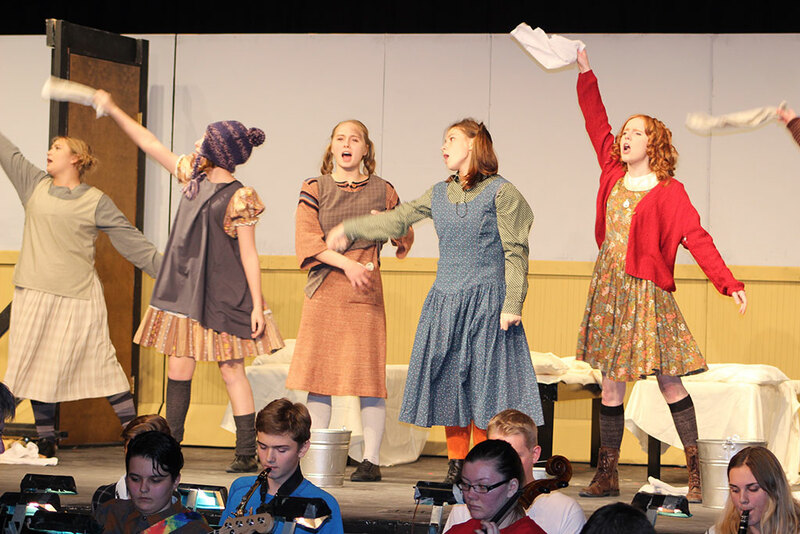 Share the post "Students develop their characters for Escanaba’s musical ‘Annie’"